The excavated city of Pompeii offers visitors a genuine feel for ancient Roman life, as they can travel back in time to stroll the cobbled streets that were buried in volcanic ash nearly 2,000 years ago. Here’s how to best visit this UNESCO-listed site from Naples. The ruins of Pompeii are close enough to the center of Naples that it’s easy to visit the archaeological site with a half-day tour. Fit it into your trip to Naples with a morning or afternoon trip, but keep in mind that there’s not much shade so it’s best to bring sun protection in summer. You’ll be back in Naples in time for an evening out exploring the city. With a full-day tour, you can add other destinations and activities to a Pompeii tour, including a hike up to the crater of Mt. Vesuvius—the volcano that buried the city in the first place. Another option is to visit Pompeii and Herculaneum, a smaller yet better preserved ancient city also buried by Vesuvius. For a break from history, consider a tour that combined Pompeii with an exploration of Sorrento or the stunning Amalfi Coast. The excavated ancient city of Pompeii is set 16.6 miles (26.5 kilometers) from Naples. Pompeii tours involve quite a bit of walking over uneven surfaces, so be sure to wear comfortable shoes. Bring water and sunscreen during warm weather, too. Half-day tours tend to be five hours or fewer, while some full-day tours can be about nine hours long. Combine ancient Roman history with Mediterranean sparkle with this full-day private trip to Pompeii and the Amalfi Coast. Travel along the winding Amalfi Coast road to towns like Positano, Sorrento and Ravello. Visit the archaeological site of Pompeii, one of Italy's most famous attractions. Choose either a fully-guided tour or to see each stop independently. Spend a day exploring the history and beauty of Campania on a private full-day tour of Pompeii and Mt Vesuvius from Sorrento or Naples. See the excavated ruins of the ancient city of Pompeii and then hike to the crater of the volcano that buried the city 2,000 years ago. Visit a nearby winery for a light lunch (own expense) and wine tour. See southern Italy’s top attractions on this day trip to Sorrento and Pompeii from Naples. Led by an expert guide, explore the UNESCO-listed ruins of Pompeii, including the Forum, the Lupanare brothel and the Thermal Baths, and pass the infamous Mt. Vesuvius volcano. After a delicious pizza lunch, travel to Sorrento for a guided tour around the charming streets, with unbeatable views of the Mediterranean. Your trip will conclude with transportation back to Naples. Go back in time two millennia on this intriguing half-day private guided walking tour of Pompeii from Naples. Get the most out of your visit to this incredibly preserved Roman city, which has been frozen since Mt. Vesuvius erupted in 79 AD. Some of the highlights include the Forum, a theater, a ‘fast food’ restaurant, and even a brothel. Your private guide will illustrate Pompeii’s tragic fate through captivating stories, facts, and anecdotes while taking you to the main highlights of the place. Choose to have the guide show you around or opt for the transportation-only option, giving the chance to check out Pompeii on your own. 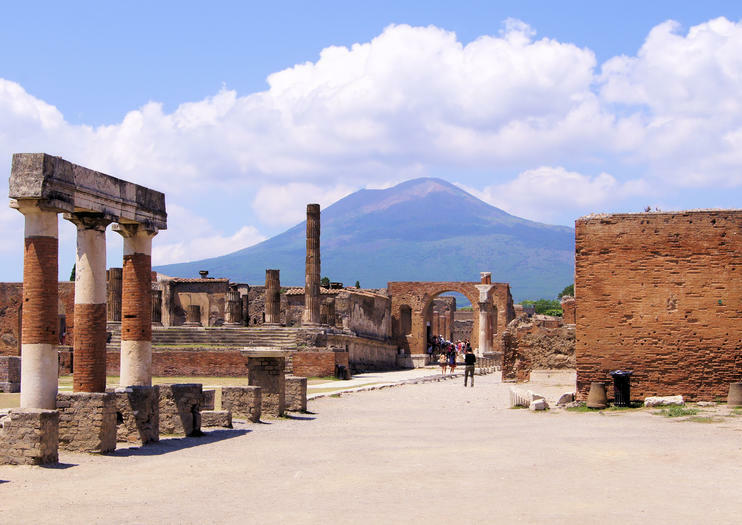 Explore Pompeii and Mt Vesuvius with this private transportation from Naples. Travel by private vehicle to the archaeological ruins of Pompeii, a UNESCO World Heritage site whose excavations reveal what life was like just before Vesuvius erupted and covered the ancient town with its deadly flow. Then head up the volcano to the crater area, where you can walk around on your own. End the day with a stop at a winery at the base of Mt Vesuvius. Note: Entrance fees are not included. Duration is eight hours. Discover the ancient town of Pompeii and the volcano that made it famous on a full-day tour from Napoli. Set out to explore the exquisitely preserved archaeological site, covered with pumice and ash during Mt Vesuvius's iconic eruption in AD 79. Wander among former villas and shops, marvel at centuries-old frescos and graffiti and learn about the lives of its former inhabitants from an expert guide. After lunch, continue over Mt Vesuvius where you'll take in breathtaking views from atop mainland Europe's only active volcano. Embark on a scenic drive along Italy’s Amalfi Coast and visit the ancient city of Pompeii on this private full-day tour from Naples. At the UNESCO-listed archeological site of Pompeii, you can get a sense of life in ancient Rome as you stride through the Forum and see the world’s oldest surviving Roman amphitheater. During the drive, stop along the way to shop or take photos in Sorrento or Positano. Entrance fees are at your own expense. A guide is available if option selected. Hike to the top of Mt Vesuvius on this half-day trip from Naples. Kick off with a pizza lunch before setting out on your adventure. Led by an expert guide, venture to the summit of the volcano made infamous by its eruption in 79 AD, leaving the city of Pompeii destroyed. As you journey upward, hear the history behind this natural wonder. You’ll be rewarded with stunning views of the Bay of Naples before heading back to your original departure point. For a more unique Pompeii experience, take this private day trip that includes the use of a 3D virtual reality headset. Explore the UNESCO World Heritage site with a licensed guide to see Pompeii as it once was, just before it was covered in volcanic ash from the eruption of Mt Vesuvius. As you wear the headset, watch 2- to 6-minute historical re-creations of the main points of interest. You’ll also be driven up Mt Vesuvius itself, where you can walk to the top of the volcano and visit the crater.